The Alaska Division of Forestry is responding to an approximately 30- to 60-acre acre wildfire in the Rosie Creek Area southwest of Fairbanks with multiple aircraft and personnel. The Livingston Fire was reported at 5:18 p.m. after several members of the public reported seeing lightning strikes in the area about 15 miles southwest of Fairbanks. 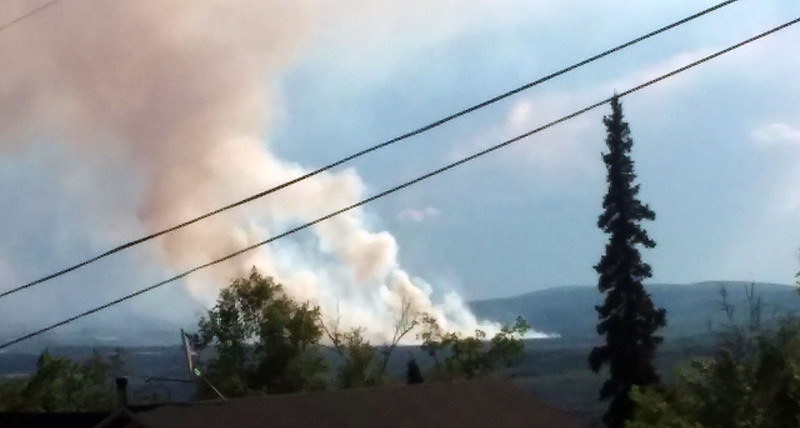 The fire is approximately 5 miles east of the Parks Highway and west of the Tanana River. The closest structures, including Rosie Creek Farm, are approximately 3 miles from the fire but the fire was moving away from structures at last report. No evacuations have been ordered. Personnel were not able to reach the fire via road because of wet conditions and firefighters are being airlifted into the fire. Sixteen smokejumpers from the BLM Alaska Fire Service were dropped on the fire to protect structures in the area and a 20-person initial attack crew from Fairbanks is being helicoptered into the fire. An air tanker based in Fairbanks dropped multiple loads of retardant to slow the spread of the fire and a helicopter was dropping water on the fire to tame it while firefighters are transported to the scene. Smoke from the fire is visible from Fairbanks and the Division of Forestry has received multiple reports of the fire from the public.